Last week, the Axonify team travelled to Las Vegas to participate in our very first Call Center Week conference. We weren’t sure what to expect, but were happy to discover that a number of forward-thinking organizations are looking to engage their call center agents in training that’s fresh, fun and engaging. And they need to do it, quickly. After a few insightful conversations, I have a whole new appreciation for the complexity of the job of a call center agent. Agents deal with (mostly) disgruntled customers all day long, must problem-solve on the spot and remember a ton of info, all while trying to keep their CSAT scores up. On top of all of that, they can have 10-20+ software tools on their desktop that they need to know how to use; there’s a ton of product and promotional knowledge they must keep fresh in their heads; and they have to follow numerous processes and procedures correctly. With all of these factors at play, the typical call center director is desperately looking for a way to help their overwhelmed agents enjoy their day-to-day work. High staff turnover, tardiness, absenteeism and low engagement rates among agents make it difficult for directors and managers to meet their business objectives. For the people we spoke to at the conference, this is a burning issue that needs a solution, fast. 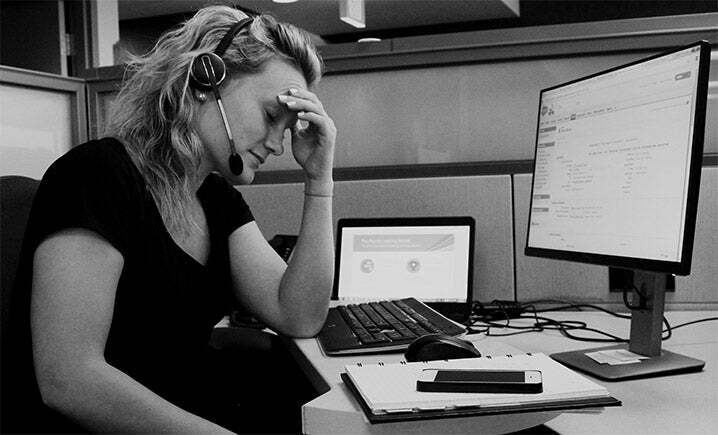 How can someone begin to transform the typical high-stress call center culture into an engaging environment that encourages employees to want to come to work every day, and perform to their full potential? The good news is we were able to offer a solution. We were able to show people we spoke to how Axonify can arm their agents with the knowledge they need to be successful in their positions, and break it down into smaller chunks that can be consumed in just 3-5 minutes a day. We showed them how the Axonify platform can reinforce the training they provide, so their agents are more likely to remember it and feel confident in their roles, instead of overwhelmed and frazzled. We also showed them how Axonify can help onboard employees faster, maximize their performance on the job, and even encourage them to stay in their roles longer. That’s because Axonify is wrapped in gamification, which includes game play, leaderboards and rewards to make learning fun engaging and promote voluntary participation every day. Seeing the light bulb go on in people’s heads when we explained Axonify’s approach to bite-sized, continual learning made our first trip to Call Center Week a worthwhile experience. We look forward to continuing the conversation on how we can help drive up engagement, and drive down stress in call centers everywhere.